Affnan's Aquaponics: Aquaponics - It's here to stay. Manage to find a suitable spot in my front yard, yes literally a yard.. its 2'ft x 9'ft so 2 square yard the most. Clearing it and digging deeper so that I can put some pebbles as lining and prefab fibre-glass as fish tank. 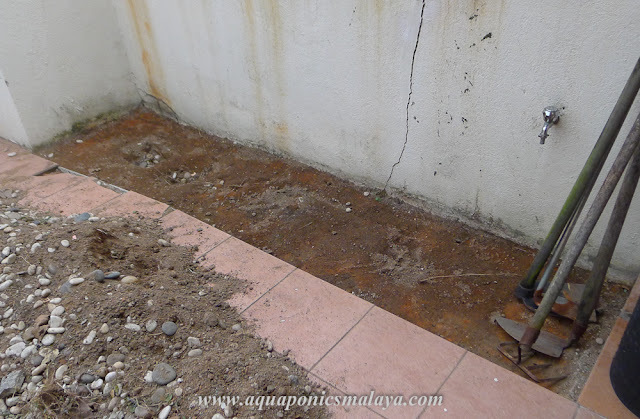 My house renovation also cover part of the front, so this Aquaponics set will need to be done after that renovation is over. I am carefully planning on how to go about doing it, especially the growbed part. Since this is in front of the house it need to be presentable. Wish me luck, so that I manage to do it around late May or early June. I can't wait how this would turn out! Me too eddie, currently I clearing, digging, measuring and figuring how to get it done nicely. Thanks Aquaponicar for the comment. This small patch is very challenging to me, since its located in the front yard. Not a problem making a normal backyard set, but for the front it need to looks good and functional at the same time.. that's the challenge. I am in the middle of setting up my Aquaponics system. Got a few catfishes swimming in the tank and some plants in the growbed before they got raided by rats few nights ago. Hi, you have a wonderful blow on aquaponics, i want to try some of your techniques to breed tilapia and vegetables in thailand. how often and how much water you change in your systems?